This run is another great overnight or day run. There are a few remaining rapids before hitting the mighty Columbia and camp and fishing options abound. The total run is around 45 miles but you can easily break that up into smaller chunks with many access options. A BLM access dirt road follows the river for most of its length here. The river usually has good flows year round. The lower elevation here allows for winter paddling. You will need a Boater Pass to float here. Checkin at Maupin for passes or more information. Below Sherar's Falls is the Buckhollow Access put in. This is a day use area with lots of parking and facilities. This is a day use area with a dirt ramp. 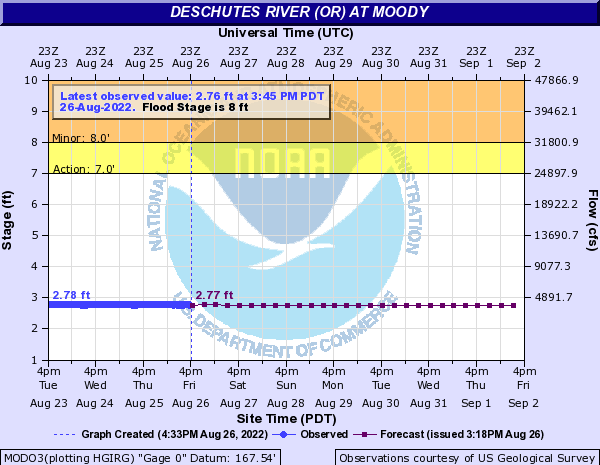 This is a good take out or put in option to break up the lower deschutes. Macks Canyon has a campground as well as historical information about the Indians that used to occupy the area. This is also the beginning of a trail that heads downriver. This is a fee area. Right above the confluence with the Columbia on river right is a nice paved ramp and day use facilities. Just below the railroad trestle bridge is an island that splits the river. Let channel is basic class II. Right channel is a little tougher with a hole. The river drops over a ledge here. Best route is to take the first wave train down from right to left. If you stay on the left channel this is mainly some small waves. 2 small islands split the river into 3 channels as the river widens slightly here. This creates a shallow entrance into 1 of the 3 channels. Most right channel is probably the calmest with the most left channel the most turbulent. Any route is not going to be harder than class II water. Large waves and a hole just right of center. Easiest line is probably just left of center down a fairly large V and wavetrain. Scout river left if you wish. A set of drops as the channel narrows. Yield to upcomming jetboat traffic if they are commited to their line. This is an area with pretty turbulent currents and eddylines. This can flip unsuspecting kayakers. Rafters can float over the boils without too many issues. Take the left channel as you approach the take out. The channel narrows and creates a class III rapid. An open camp accessible from the river or by car. Toilet and not much shade here. BLM camp fee. River left medium sized camp. Large camp on river left. Smaller to mid sized camp on river left. River right. Vehicle and river access. Full service fee based camp. A so-so camp on river left. No shade. This camp isn't very river friendly. River right. Fee area. A large camp on river left. Good eddy pool with sandy beach makes this a nice camp even if the shade is limited. A small camp on river left. River left medium sized camp with some shade. River left camp with a toilet. Large camp on river right. Toilet. On river right on the river bend are a couple of large camps with good shade, a beach and a toilet. Good camp on river left. River left just north of the dirt airstrip. Toilet. A couple of large camps with good shade and a toilet on river left. river left. No campfires, dogs or camping while cattle present here. Mid sized camp river right. River right camp with good shade. Small camp on river left not far below washout rapid. Several small camps on river left. This area can also be reached by 4WD on the free bridge road. This is one of many small camps on river right in this area. You can find camps here from bathtub camp all the way down to commisioner camp. Located on river right about halfway down the rapid. Good beach with not a lot of shade. Small camp on river left with toilet access. Large camp on river right. Shade and pit toilet.